Leo was born just after one in the afternoon on January 21. The doctors said that the baby had been born with Down syndrome and the parents experienced a few minutes of shock. The shock passed when he Leo’s father held him for the first time and fell in love. The pediatrician brought Leo to see his dad. The baby’s face was covered up and the hospital staff wouldn’t let Samuel Forrest see the baby. The doctor paused, looked at Forrest and told him there was a problem with his son. Speaking to ABC News, Forrest recounted what he experienced when the physicians and nurses told him his son had Down syndrome. Then Forrest held his son for the very first time. Forrest’s wife’s reaction wasn’t what he was expecting. She gave him an ultimatum — the baby or her. Keep the baby and get a divorce. Despite the warning, Forrest claimed to never have any doubt that he would keep his son. A week later, Leo’s mom left home and filed for divorce. Samuel was left to raise his son alone. “He’s beautiful,” Samuel Forrest told ABC News. “He’s perfect and I’m keeping him.” Forrest established a GoFundMe account to raise the funds needed to take Leo home to New Zealand. As of February 5, the amount raised passed the target. In nine days, Forrest had raised over $60,000. The amount grew to just over $500k. The stress of a gravely ill child can take its toll on a marriage, especially a marriage that already had some cracks in the foundation showing. The added stress of a sick child can send marriages over the wall into divorce. Some observers say that a wedding has as much as a 90 percent chance of falling apart when a child is diagnosed with what could be a fatal illness. That’s what “observers” say. The truth is that research don’t support the dire statistics. It is true though that the marriage will change. Parents of terminally ill children change and with them, the parent’s relationships change as well. Some of the worst fears and strongest stressors will affect the parent and challenge the world view that they have held close. The marriage can survive and may become stronger and more intimate. It all hangs on how the parents handle the situation. Deborah Raiees-Dana lost her ten-year-old daughter to cancer in 1999. When her spouse filed for divorce, Raiees-Dana found there wasn’t anything in writing to help her cope with the grief of losing both her child and husband. She sat down and wrote a how-to guide of sorts for parents facing the same rough path she had just traveled. Over the years, she has updated the paper and it is available online. Remain aware of some of the issues the marriage will encounter. Knowledge, combined with alertness, can keep parents from being caught off balance. More knowledge of the situation will also help increase the sense of control. There will be outside forces on the marriage and either, or both, of the parents may anticipate how they can manage the pressure. The pressures can either destroy or strengthen. With some reflection and thought, the marriage should survive. Finances are already a source of friction in many marriages. When a child is first diagnosed, the community rallies and raises funds for the parents. Over time though, the disease continues even as the money dries up. In addition to medical bills, there will be expenses for meals, travel, lodging and those items which were forgotten at home and need to be replaced at the hospital. With a child in the hospital, there isn’t time to clip coupons and everything adds fuel to the potential for arguments. A social worker might provide contact information for organizations that may provide financial support. Trouble with creditors? Consumer Credit Counseling can intervene sometimes. Hospitals are not excellent locations for catching up on sleep. Once you get home with your child, a parent can still expect their sleep to be fitful. Rigid schedules demand that medicines are given on time and frequently your child may need other assistance during the night. A parent’s worry and stress can block a good night’s sleep and physical reserves can be destroyed due to a lack of sleep. Being in a hospital, even one close to home, can lead to a feeling of isolation. Some diseases may demand that your home be almost quarantined even after coming home from the hospital. Friends and family may evade you since they don’t know what to say. With the demands of caring for a sick child, the parent may find themselves too tired to maintain contact with friends as well. Communication with a spouse can also be threatened from the lifestyle needed to care for a sick child. Hospitals aren’t great places to carry on in-depth, intimate conversations. As the hospital if there’s a room available where the parents can talk freely. Failure to do so can lead up to pressures that may blow eventually. Even with a sick child and the feeling that everything in the world must revolve around him or her, the truth is that life goes on and there are other commitments to be handled. Other kids in the family may need to be cared for; the extended family may end up being a burden and trying to balance a job with the child’s needs can be challenging at best. There may also be community commitments such as religious, civic and social groups. And don’t forget, your spouse needs your time as well. Family, friends and a faith group often can provide support. Don’t be leery of asking for help too soon — early support could prove to be the difference in a surviving marriage or a failing one. The hospital will have trained professionals who have experience in similar situations. 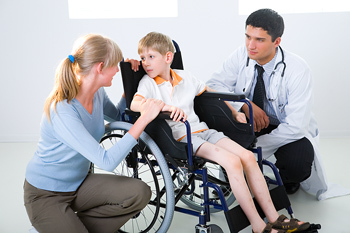 Besides medical personnel, hospitals often have social workers, child life specialists and mental health workers available. Make use of all the resources you come across. To avoid isolation, connect with other parents who know what you’re going through. The hospital staff, as well as clergy, is probably able to provide you with contact information for a self-support group that fits your needs. Deborah Raiees-Dana understands that it takes two to make the marriage work and she freely shares her experience with others. She reminds every parent of an afflicted child that there is hope and help.